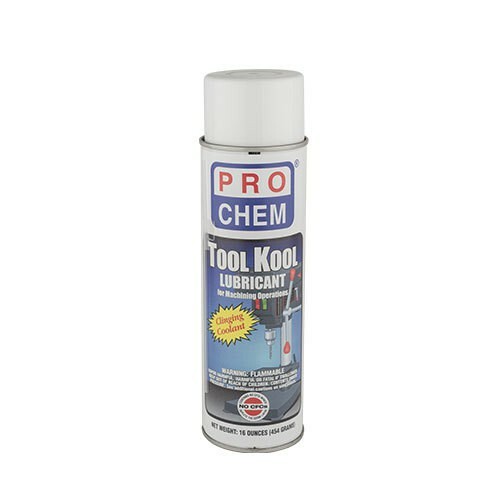 Tool Kool | Pro Chem, Inc.
TOOL KOOL is a heavy-duty cutting lubricant that is formulated for all types of machine shop uses. It contains a special synthetic blend of lubricants and thickening agents making it ideal for difficult machining, tapping and thread cutting operations that involve high carbon steel, alloy steel, stainless steel, as well as free machining soft steel. Its unique formula clings to the cutting bit to provide excellent lubrication and rapid heat removal, to extend valuable tool life and ensure a superior finish. TOOL KOOL is made especially to withstand extreme pressure and keep operating temperatures low. SHAKE WELL BEFORE USING. Hold nozzle 6 to 8 inches from surface requiring lubrication. Generously spray onto cutting surface or tool. Reapply as necessary to maintain lubrication level. Note: Not recommended for use on copper or aluminum.